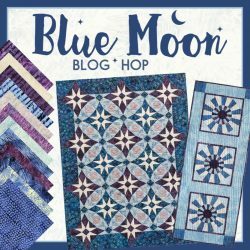 Today is day three of the Blue Moon Blog Hop…and it’s my turn! Before I get into what I did, be sure and visit today’s other hopper – Deb made something cool with Jackie’s new fabric line! Here is the full schedule. Feel free to go back and see the previous posts. Make sure to visit the other sites in the coming days. Pattern designers will sometimes offer a pattern that has a specific holiday theme. Sometimes these patterns lend themselves to be something other than that specific holiday. Poinsettia Petal Runner by Penni Domikis is such a pattern. I’ve made it once before as a holiday runner. I wish I had a photo but I gave it away as a gift. I’ve been wanting to make it again but in non-holiday colors because it’s such a cute pattern. When I saw Jackie’s new Blue Moon fabrics I just knew it would be perfect. 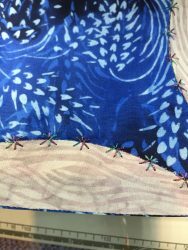 Not only is this fabric line in my favorite colors (purple and blues) but the motifs on the fabrics themselves are birch trees, pine cones, snowflakes…all things that are right up my alley! 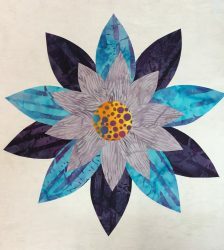 This pattern comes with templates to cut out all the orange peel shapes but it’s so much easier if you have the acrylic templates that Penni has created. 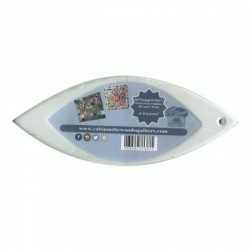 Once you use the acrylic templates you’ll see how versatile they are for other patterns as well. It’s always a plus when tools can be used for multiple projects! I did deviate from the pattern a bit for the cutting portion because I was working with chunks of fabrics rather than longer yardage. I also applied Misty Fuse to the petals because…well, I’m lazy…err…I mean, I like fusible! I think it turned out great. I can see this pattern done in fall colors or pastels for spring or maybe a Halloween version! I also deviated from Jackie’s fabric line for the centers of my flowers. This little scrap of yellow with blue and purple dots was sitting on the cutting table (used in another secret project) and it just went perfect. I did add the stitching to the center section orange peel blocks. I chose a cute snowflake-ish decorative stitch on my machine. Here’s a little tip when topstitching like this. Your machine will jump all over the place as it goes to and fro. Sometimes it can be tough to keep it stitching on the line. 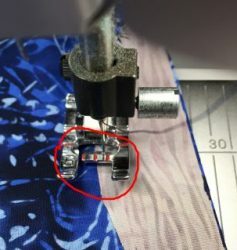 Use the little center mark on your foot and do your best to keep the fabric edge on that line. Don’t have one on your foot? Use a fine sharpie (or white-out or nail polish) to make your own mark! So, there’s my project. What do you think? If you would like to try this pattern you can find it on my website here. The acrylic templates can be found here, here and here. I would love to see photos of what you do with this pattern. Do you like holiday themed patterns or do you prefer everyday projects? Thanks for your time today. I’ll randomly draw the winner on Friday February 9th at 9pm EST. Any comments left on this post by then will be eligible. I love your project! And, well…I like holiday themed patterns…but, I like to be able to use them for everyday projects as you did with this one! Great idea. Thanks for the opportunity to win the Sandy Toes starter kit! Such a cute pattern. Love those flower buttons! Are those artificial flower petals you used under the small buttons? Thanks! I do like holiday themed patterns, but I prefer everyday projects more. I think my comment disappeared. I like every day patterns as they are more versatile. Love the snowflake accent stitching!! Wow very nice!!! The quilting you did on your Sandy Toes is lovely – really attractive!!!! Thanks for sharing!! I prefer everyday projects, but jumped in excitement over your Fiesta de Azucar!!! I prefer everyday projects, but seasonal/holiday projects have been catching my eye recently. My comment is not here???? Hey Susan…you’ve won a prize! Please email me and let me know what your shipping address is so I can send it to you! While I like holiday projects, I’m more likely to put my time into items that can be used and enjoyed for a longer period of time. I prefer everyday themes. When it’s a holiday theme I never finish one in time for the holiday! I like holiday ones for decorating–have made quite a few table toppers–but I also like the everyday projects–Your idea to use a seasonal design for everyday was great! I prefer everyday projects. I live in a small apartment and don’t have space to store a bunch of holiday-only quilts/decorations. 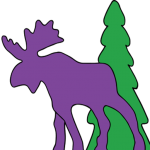 I love the colors in your project. Blue Moon is so pretty. I also like a variety of patterns. Some holiday ones can be done in non-holiday colors and look great. Thanks. I am partial to everyday patterns, but really love them all. 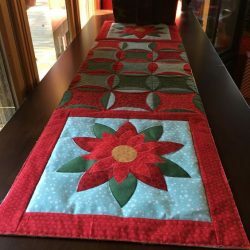 I love holiday projects as well as everyday patterns. And I love those flip flops! So pretty. I love both! My grandkids get a kick out of the holiday items i make for them. WOW I loved your extra defined edge on the blue peel with snowflakes – thank you for this extra inspiration! I do like holiday themed projects, but prefer everyday ones so that I can still use it even if I don’t finish it by the the time the holiday arrives.